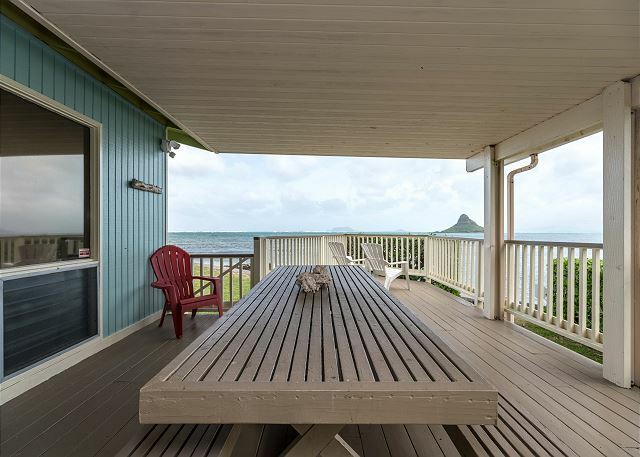 Experience this oceanfront home that is true Aloha. 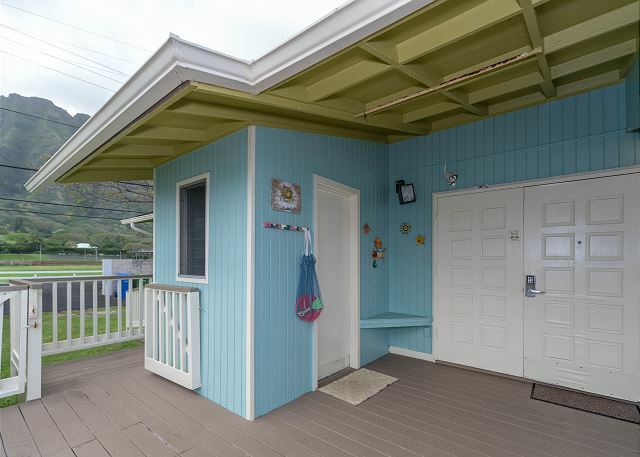 A charming two bedroom, two bathroom bungalow located in Kaneohe with extraordinary views. 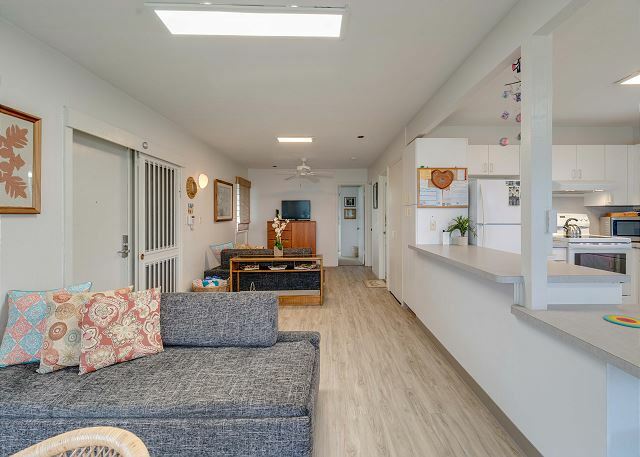 The home itself is comfortable, well stocked and private. AC in both bedrooms. 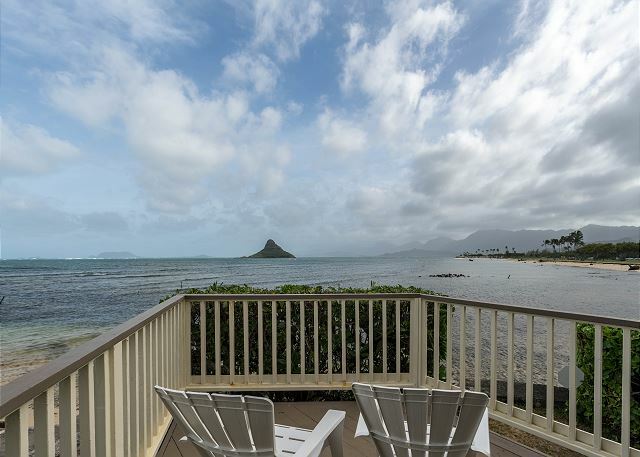 The first home on the beach facing Chinaman's Hat with neighbors to one side only. 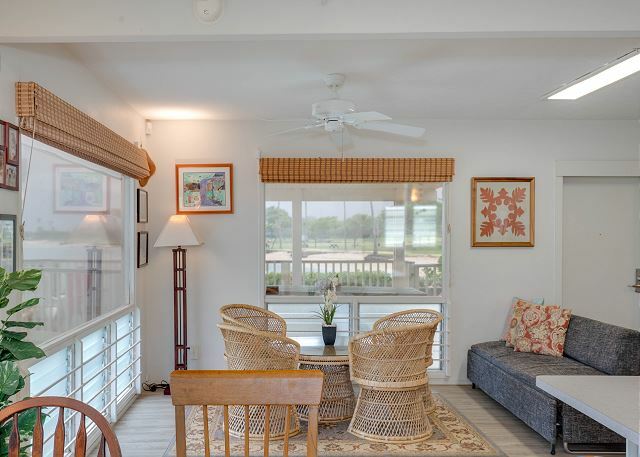 The occupancy is up to 5 guests, please note that the 2nd bathroom is outside access, located on the deck a few steps from the front door of the house. 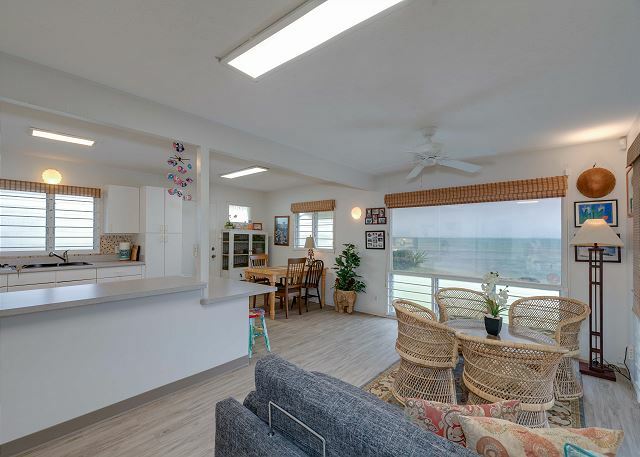 Sit on the shaded lanai and begin every day watching the sun rise over turquoise water while balmy trade winds breeze by; relax in the evening as the sun sets majestically over the stunning Kualoa mountain range. 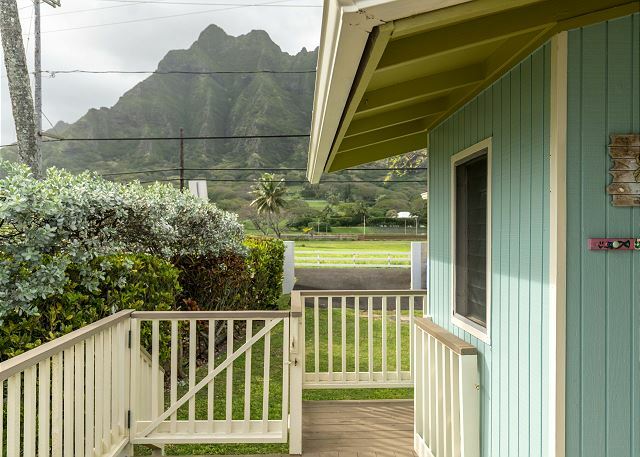 Snorkel directly from the front yard, or simply cross the street to take advantage of everything Kualoa Ranch has to offer, including hikes and horseback riding. This exquisitely beautiful part of the island is often featured in television and movies, including "Lost", "Hawaii 5-0" and "Jurassic Park". 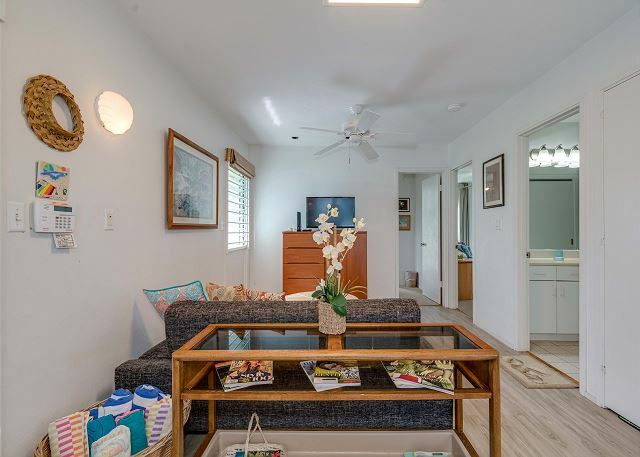 The Hale's location makes day trips into Waikiki, Pearl Harbor and all other visitor sites an easy drive away. 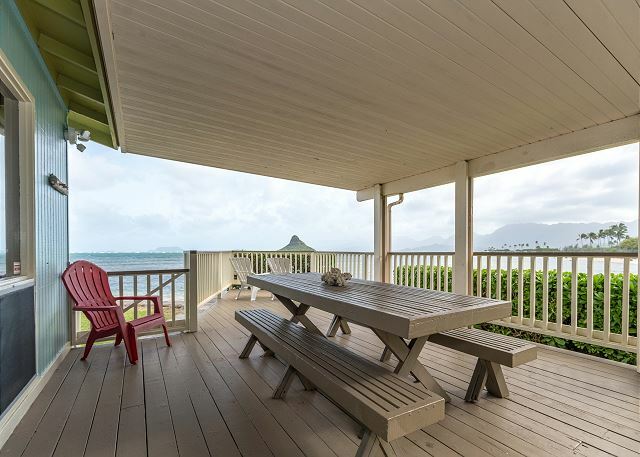 Like many beachfront homes in Oahu, the house is located off the main coastal road. Most guests seem to stop noticing the traffic sounds after they have settled in, this is helped further if a/c and fans are turned on. However, if you are sensitive to noise this rental is not the best option for you. Please call our office directly with questions. Other: Sofa Bed. Pack n plays, cribs and kids beds can be rented and delivered. AC in bedrooms only; fans throughout house. We thoroughly enjoyed this rental. Home was clean, had adequate start up supplies, plenty of cookware. Road noise did not bother us, we used the air conditioning at night. You can snorkel right off the property, great place to kayak, have to rent them but not too pricey and they drop them off to you and pick up. Overall a beautiful stay, morning sunrise, sea turtles, sardines swimming in low tide, gorgeous night sky, so relaxing! We ate every meal out on the deck, bbqing every night, great place! Manager Response: Thank you for painting such a lovely picture, Myer Family! We are so happy you enjoyed the home and hope to see you again. Mahalo for staying with us. 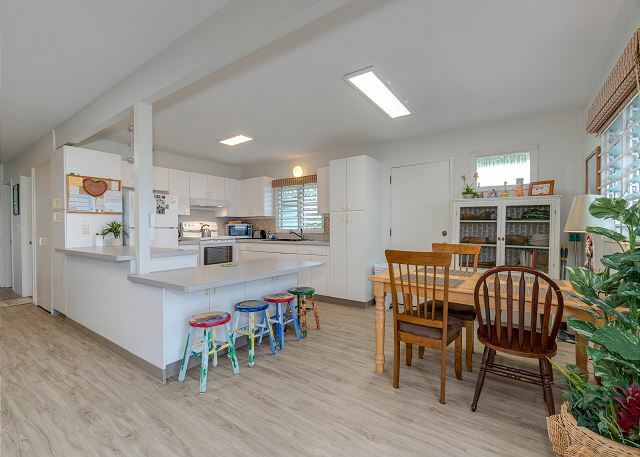 We traveled to this house during March 2019 with two young kids (2 and 5). 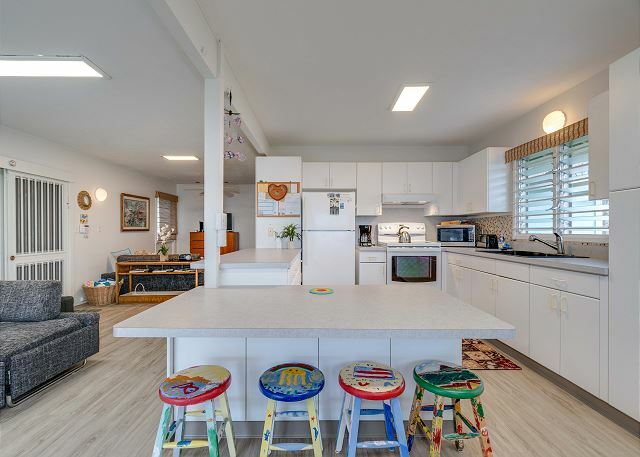 The house had many of the amenities that were helpful, extra sunscreen, aloe lotion, soap, beach towels, umbrellas, binoculars, games, books, cable, pots, pans, coffee machine, plates/bowls (plastic for the kids). No dishwasher but that is no problem really. There are also some fins and snorkel gear, not in the best condition but workable. There are no condiments here, like salt and pepper or cooking spray or anything so prepare for that if you plan to cook your own meals. 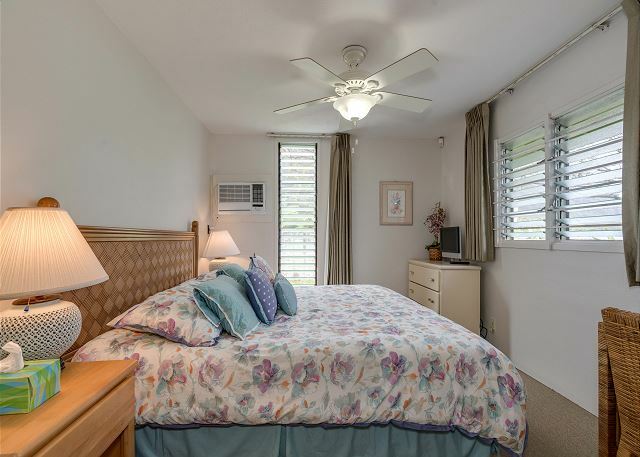 The rooms had air conditioning and yes the property is right by the road but the fans cover that up. The beach park is right next door which was fabulous, we would wake up, get coffee and go look for shells. The neighbors are friendly as well, the other house right next door is a rental too but not as nice from what I heard. The deck is fantastic and the outdoor bathroom was a must for getting cleaned up. I would definitely rent this property again. Renting a car is a must for this location too as it is 10-15 minutes to the nearest grocery store (Times). You can find restaurants and food trucks along the highway which were a fun adventure as well. We had a fabulous time! 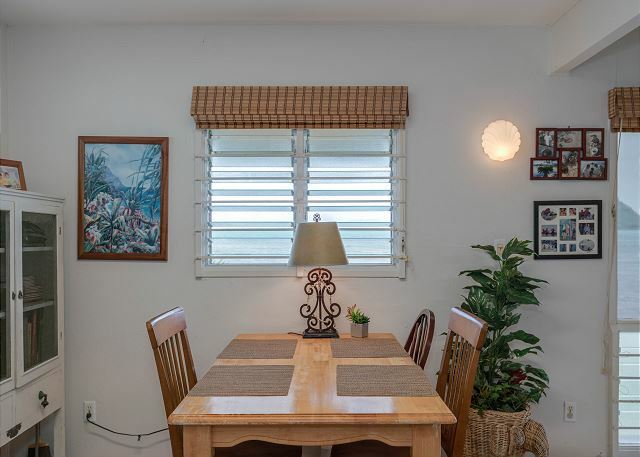 This was my third trip to Oahu in 5 years and I stayed at this house all three times. I look forward to visiting this home in the future. Manager Response: Mahalo for staying with us again Scoville Family! You are treasured guests. We look forward to seeing you again soon. Great little home on the beach. Views were,amazing. Listen to waves. Enjoy the shade under the patio or lay out on the yard. Kayak to Chinamans hat or,just snorkel. Road noise at night was silenced by the air conditioners. Couches were perfect for kids to sleep on but not super comfortable for adults to sit on. Would stay again. The views both ocean and mountains were fantastic. 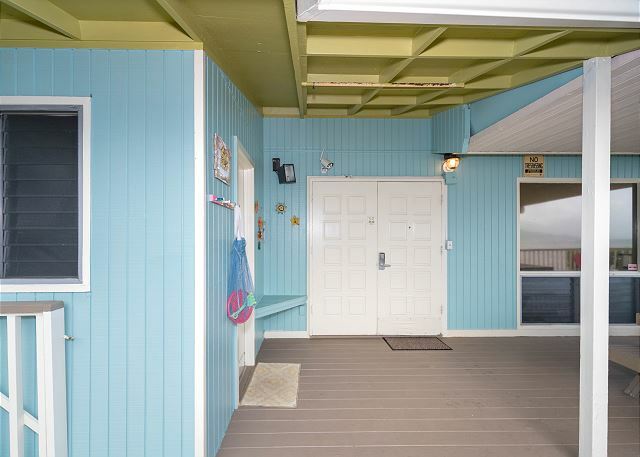 A small beach right in the yard and a beautiful sandy beach park right next door. 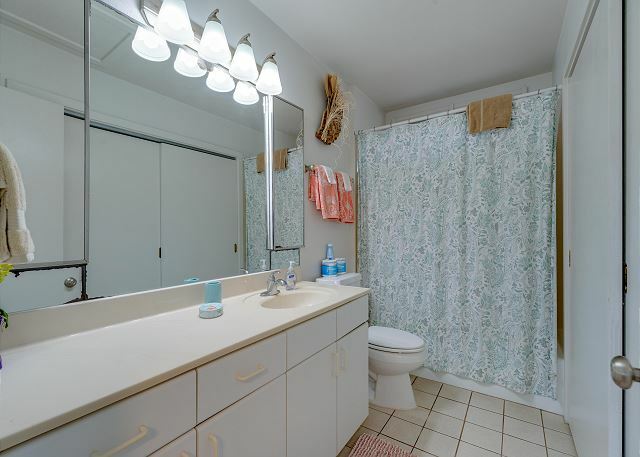 Very clean with all you needed for a great stay. Only negative was the Kam highway traffic at night, all night! If you’re a light sleeper you need to sleep on one of the futons in the living room area. 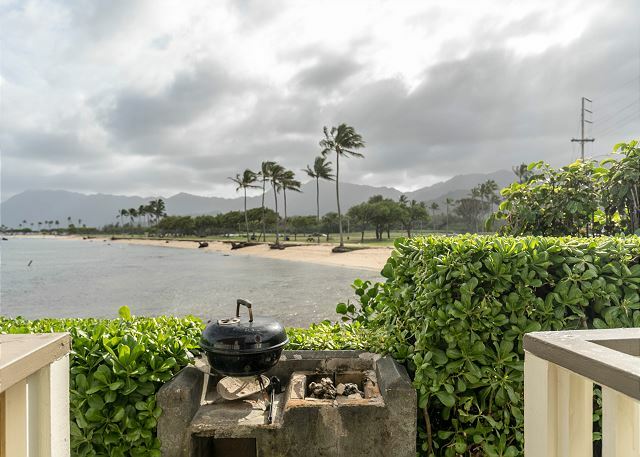 A Nice place to escape on the North Shore of Oahu. 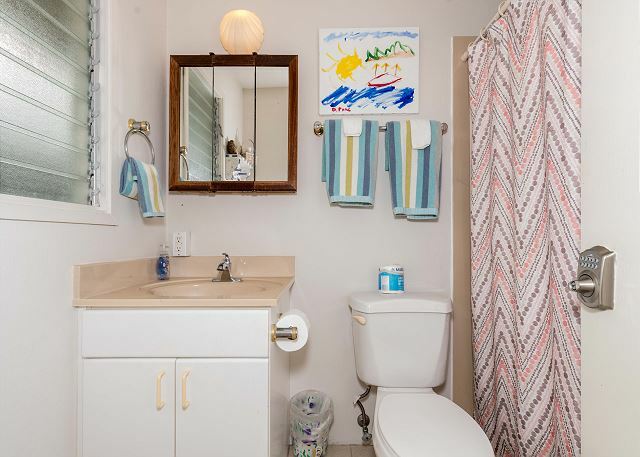 Ideal for a family of four, but not particularly well suited for 2 adult couples. The views are terrific and well worth the price. That said, the cottage is rather rustic, but it is comfortable. The location is well suited for explorations of the North Shore. 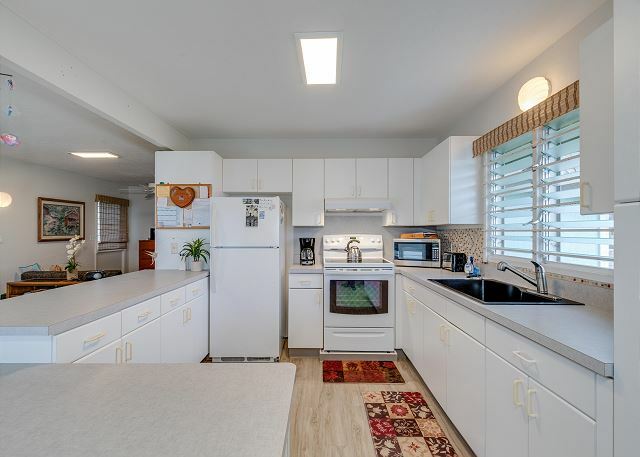 The unit could use some upgrades, but it is sufficiently equipped and provides everything you need for cooking and dining. There is a great selection of beach gear for guests to use. Couch and interior seating could be improved. Alarm system requires closing up the house every time you leave so you return to a warm house. The moment we stepped onto the property we knew we had made the right choice. The views alone were amazing, and the sea lapping onto the shoreline was magical. We really liked the home and found it comfortable and more than adequate. 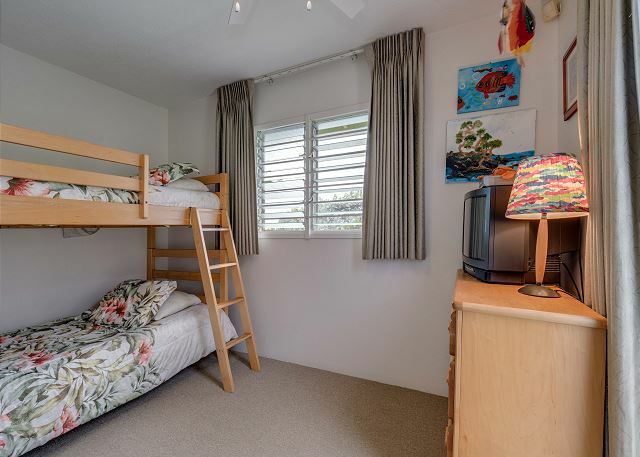 Would have liked a 2nd bedroom with at least a queen bed, but we made do even though bunk beds are inadequate for an adult couple. Really was the only shortcoming that we found to be off putting. The traffic was loud but I had read reviews stating that but the tradeoff for the beachfront was well worth it. The management company helped us out with a forgotten entry code, and the entire stay was great. We really enjoyed snorkeling with turtles right outside our back porch. 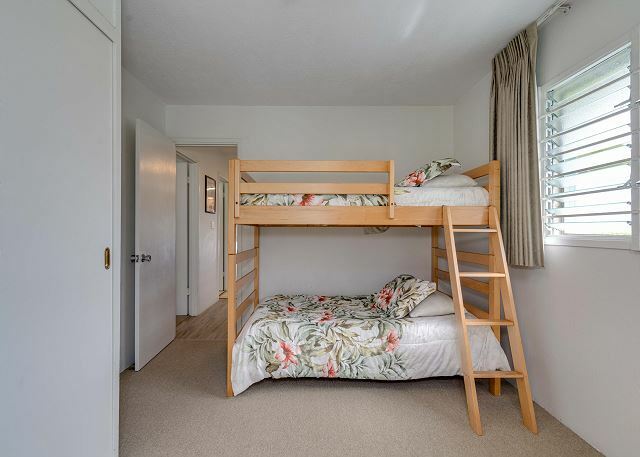 We (4 adults) spent 5 days at the Kouloa Hale and loved every minute. 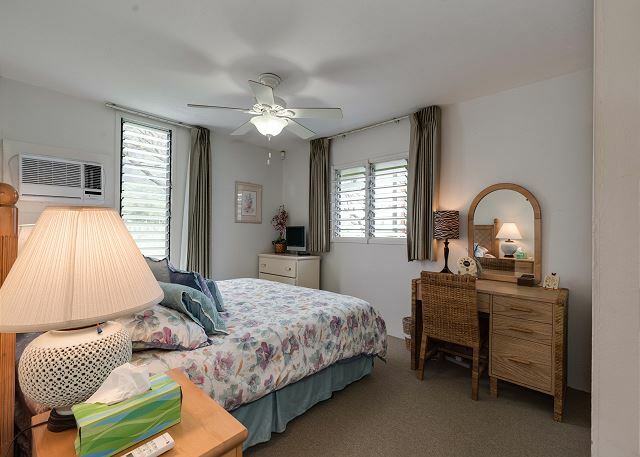 Beautiful view, comfortable house with plenty of space, and close to Waikiki and north shore. Only thing less than perfect was that seating could be more comfortable inside. Hawaian Beach Times rents & delivers kayaks at a very reasonabl cost. Truly a vacation in paradise.